Open-learning leaders will present a free webinar on the latest “connected learning” research, its relevance in society and how it can be applied in higher education. 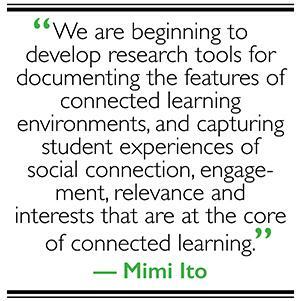 Connected learning is an approach to education in the 21st century that takes advantage of today’s abundance of information and social connection. The webinar is part of a series being offered via the new online course, “Connected Courses,” which is being taught by open-learning pioneers who developed the curriculum for fellow college and university professors to learn to teach their own open courses. Viewers are welcome to post questions and comments via Twitter using the hashtag, #CCourses. The webinar features Mimi Ito, research director of the Digital Media and Learning Research Hub, chair of the Connected Learning Research Network and professor in residence and MacArthur Foundation chair in Digital Media and Learning at UC Irvine; Vera Michalchik, senior associate director for learning sciences and technology at Stanford’s Center for Teaching and Learning; and William Penuel, professor in educational psychology and the learning sciences in the School of Education at the University of Colorado, Boulder. Ito, Michalchik and Penuel will discuss their ongoing research on connected learning. Connected Courses, supported by the University of California Humanities Research Institute, Digital Media and Learning Research Hub and MacArthur Foundation, runs from Sept. 15 through Dec. 14.